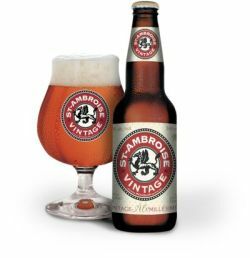 Also known as St.Ambroise Millésimée. In honour of our tenth anniversary, McAuslan Vintage Ale has been brewed to continue the centuries-old tradition of strong ales and barley wines. Vintage Ale is rich and malty, with a surprisingly well balanced and clean hop finish provided by classic Goldings hops. The ale is unfiltered and derives its orange hue from wheat malt blended with pale and Munich malts. The malts also provide a hints of caramelized fruit reminiscent of a Christmas pudding. McAuslan Brewing will celebrate each new year by brewing Vintage Ale on our anniversary. As a vintage product, we estimate this ale will remain in good condition for a number of years. The 2006 edition is down from 9.4% to 9.2%. In 2007 this went to 8%. In 2009 this went to 9.8%, and in 2011 it went to 10%. All vintages of this barley wine (1999-2011+) are to be rated on this page. How the hell have I not rated this! Drinking 2007 vintage right now...but I've gone through dozens these...from 2003-present. Good lord. This one is an opaque dark copper with a thin off white ring. Raisin, toffee, basement must, dead dried hops, diluted apple brandy and some pear, mild carbonation and moderate body, semi sweet with a boozy finish. Bottle from Jeremy. Medium Amber, pours kind of flat. Peaty, malty aroma, kind of smoky. Taste also brings some dirty, peaty flavors, mild booziness. 2009 vintage pours out burnt caramel topped with a small head. Nose is sweet malts pit fruit caramel. Tatse is more of the nice sweet malts and some caramel. UPDATED: JAN 18, 2018 A super barley wine, ftw! Solid and strong balanced taste, not too overwhelmy. Bottle. Copper body, big beige Head. The Aroma Has cognac, alcohol, tobacco, perfume. The palate is thick and foamy. The taste has raisins and red wine. Delightful. Old review from June 14, 2015. Vintage 2012, bottle from LCBO, aged more than a year at home. Strong aromas of toffee and oak, sweetness. Reddish brown with off-white head. Touch of sharpness in taste. Flavours of toffee and caramel; smooth mouthfeel. 2009 bottle shared by luttonm. Thanks! Twist off cap. Reddish orange pour. No head. Dusty dark fruit aroma. Flavor is dry, dusty, soft dark fruit paired with strange malts. Soft cherry as well. An odd beer for me, but drinks decent. Hmmm. Interesting one here. 2011 Edition, 10%abv. Rated 2013. Poured an average size 1/2" thick head that goes away rather quickly and leaves an extremely thin coating. Has a cloudy, rusty copper appearance. Alcohol is pretty noticeable. Yeasty and bready malt aromas dominate with spiced hops. Kind of like a brandy scent. Sweet flavours abound, caramel, toffee as well as spices, herbal hops, yeast, plums and raisins. The alcohol also makes an appearance. Nice warming sensation. Slick drying mouthfeel. Slight tingling aftertaste. Strong and bitter finish. Lively carbonation. Pretty good stuff! Millesime de 2006 dégustée au mois de juin 2017! Magnifique bière à l’arome et au gout complexe et fondu. Notes de pruneau et finale de réglisse. gout long et persistant. On ne sent pas l’alcool de 9.2%. UPDATED: APR 15, 2017 Two ratings, since RateBeer considers these the same beer. They’re not. 2016 bottle: consumed young in April 2017. Pours a clear amber, not too bubbly, but not as flat as a lot of barleywines. Aroma is initially earthy and subtly sweet, not a lot of alcohol for its 10%. Surprising amount of bitterness up front, but subsequent sips reveal a malty and floral backbone. Bitter hops sit on the tongue throughout; age would probably mellow this out. Scores: Aroma 7, appearance 4, taste 8, palate 5, overall 17 - total 4.1 2012 bottle: consumed a few days later, April 2017. Not at all clear; a cloudy brown - looks almost like thick apple cider. Suspended particles visible through the haze. Bubbles barely there; just a hint of white at the edge of the glass. Aroma is a rich cocktail of malt, caramel, and apples. Palate is thick, but mouthfeel is negatively impacted by the low carbonation, which has reduced significantly with age. Taste: light bitterness, moderate sweetness. Apple and caramel with a hint of rusted metal. This is very good, but has probably aged past its prime. Would have loved to try the 2013 or 2014 bottle. I’ll be saving my other 2016 for two more years. Scores: Aroma 9, appearance 2, taste 8, palate 4, overall 17 - total 4.0.